When you first begin thinking about your bathroom remodel, chances are you aren’t fretting over where to put essential bathroom features like the towel bar and toilet paper holder. You’re excited about your bath-to-shower remodel, the gorgeous tile work, and must-have details. Eventually, though, bathroom remodeling comes down to finding the perfect place for every feature, especially the essentials. In this spirit, here is our beginner’s guide to where to put essential bathroom features in your remodel. Towel Bar and Rings: When it comes to the towel bar and rings, there are multiple places you can put them, but functionality is key. Naturally, you want towel bars within reach of the shower and towel rings close to the sink. Height-wise, the average height of a towel bar should be 48 inches from the floor – same goes for the towel ring. Of course, average height is just that – average. If you and your loved ones are on the shorter or taller side, you’ll want to adjust accordingly. This is an especially important consideration for children’s bathrooms, where lower (say, 36 inches from the floor) is better – at least until growth spurts come along. Toilet Paper Holder: You might not think about it every day, but your toilet paper holder also needs to be installed in the perfect spot. Wall-mounted toilet paper holders work best installed 26 inches above the floor. This applies to comfort height toilets as well. You’ll want to place your holder 8 to 12 inches away from the toilet bowl. Your installer should handle specifics – measuring from the front of the toilet bowl, and finding the sweet spot somewhere between 8 and 12 inches, depending on the height of household members (shorter = 8-10 inches, taller = 10-12 inches). Towel Warmer: While it may be tempting to save space by putting your towel warmer on the bathroom door, this is a technical impossibility and a fire hazard – the warmer needs a correct electrical hookup, and bathroom doors can overheat and catch fire. Installing the towel warmer behind the door could trap heat as well. Of course, you don’t want your towel warmer too close to the shower or bath – water splashing could become an electrocution hazard. The perfect spot for a toasty towel warmer is at least 12 inches away from the shower, firmly secured to drywall with proper ground wiring, 36 inches up from the floor. This is one bathroom feature you won’t want to try figuring out on your own – be sure to consult with your installer. Shower Niche and Soap Dish: Shower niches have been deemed the new must-have for shower remodels, but where to put them? The perfect height for a shower niche is chest to eye-level — anywhere from 48 to 60 inches for most adults. Depending on the height of your bath products like shampoos and shower gels, you’ll want about a 12 by 24 inch space for each shelf. You’ll also want to place the niche on an adjacent or opposite wall to the shower head, to avoid spray every time you reach for something. Soap dishes, on the other hand, tend to go between the shower head and valve or on the back wall side in the middle, about 10-16 inches off the tub. Once again, customization for smaller members of the household is a key consideration. Make sure your installer knows exactly who will be using the bathroom – and how tall they are. Everything in Its Right Place: One of the greatest joys of a professionally installed bathroom remodel is when you actually begin using the bathroom and find everything is in its right place. 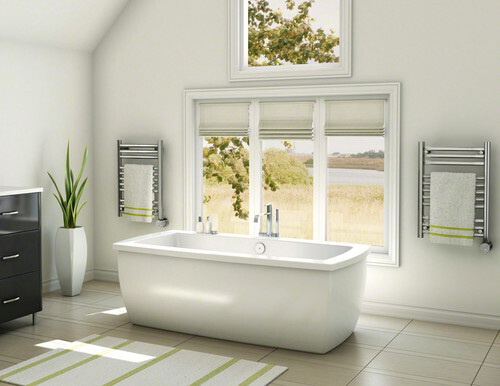 Beyond key features, smaller yet essential bathroom features have their perfect spot, too. To ensure your bathroom remodel is finished with every detail in mind, contact us at Crystal Bath & Shower Company. We’ll give you a free quote and expert advice on every aspect of your bathroom remodel, from the shower pan to the shower niche.